A new survey suggests people in Saskatchewan and Manitoba plan to spend, on average, $27,200 on a future wedding. That figure is the highest in the country. The survey, done for a subsidiary of the Bank of Montreal, asked people about their plans for a wedding and honeymoon. The financial institution suggested the results point to a need for a savings plan to meet expected wedding expenses. The national average for a wedding plan was $14,700. 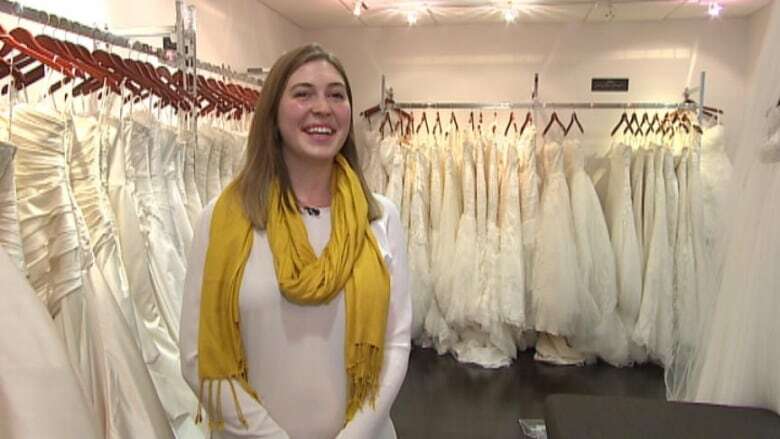 In Regina, bridal shop manager Amanda Dunnigan-Flottorp, herself a bride-to-be, said she is not surprised that people in Saskatchewan have big plans. "I've seen a budget from $20,000 to just over $50,000," Dunnigan-Flottorp told CBC News, adding it is good for business at NWL Fashion. "The wedding industry, it's definitely a money-making industry"
She said her own plan is for a lower-cost wedding. "We don't want to go into debt for a party," she said. "We want to have money to start our life together." Dunnigan-Flottorp said she understands how brides feel as they plan for their special day. "When I watch the girls shop [I can see] they really want to feel special," she said. Dealing with the cost, however, can be challenging. "It's a financial burden," she said. "It's a lot of money to spend on one or two days." People from the Prairies were also planning for pricey honeymoons, with the survey noting the average Saskatchewan or Manitoba couple was looking to spend $18,700 on post-wedding travel, far more than the national average of $5,200. Replay the Saskatoon Morning live chat that looked into the cost of weddings in Saskatchewan.